On Friday, embattled SFPD Chief Greg Suhr released a new, or expanded batch of offensive text messages sent between officers that were uncovered in a recent sexual assault investigation of one former officer, Jason Lai. Saying "We have nothing to hide" and telling the AP that "The vast majority of police officers are shaken" by this scandal, Suhr gave a press conference and pledged to make sure every member of the 2,100-member police force take an anti-harassment class in the next month. 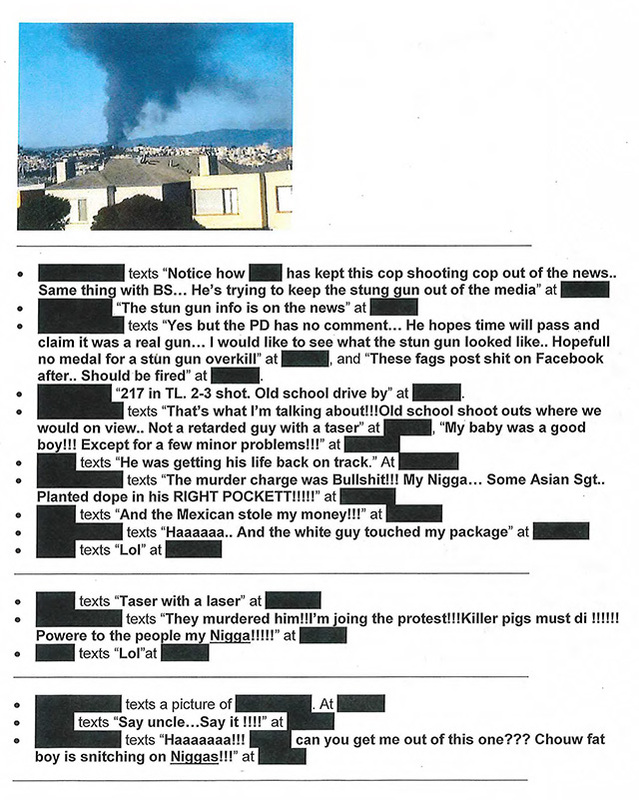 This scandal, which began unfolding earlier this month, follows the similar scandal of last year in which at least 14 but as many as 17 SFPD officers were implicated for exchanging racist and homophobic messages some years prior  a case that led to no terminations because the statute of limitations had run out by the time the texts were discovered. 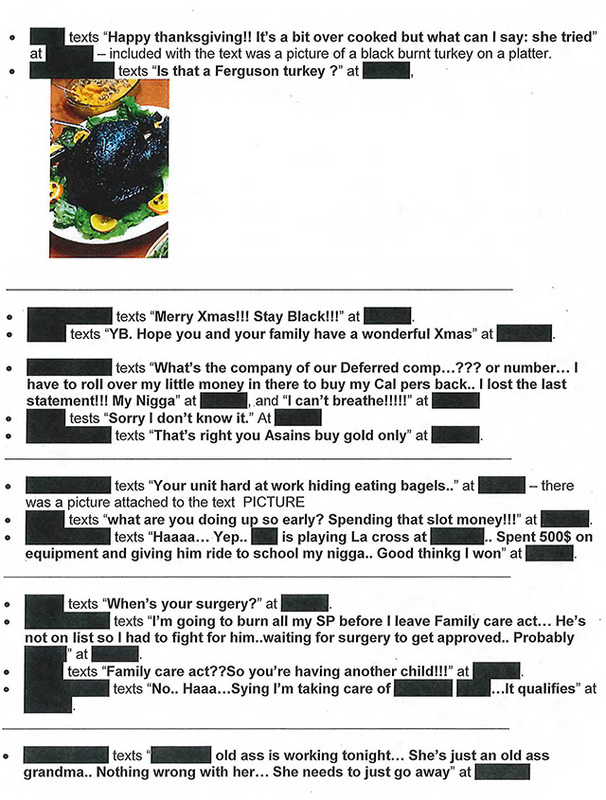 Suhr continues to insist that these texts reflect "the actions of a few," while Public Defender Jeff Adachi is saying, "These texts evidence a deep culture of racial hatred and animus against blacks, Latinos, gays and even South Asians," and "It can no longer be said to be an isolated problem." 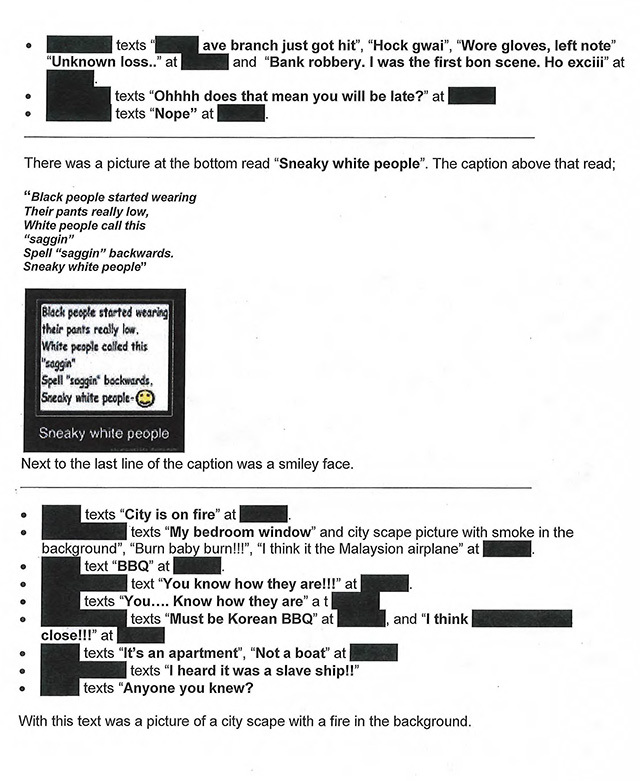 We showed you a selection of the new batch of texts earlier this week, via the DA's office, and now we appear to have the rest. 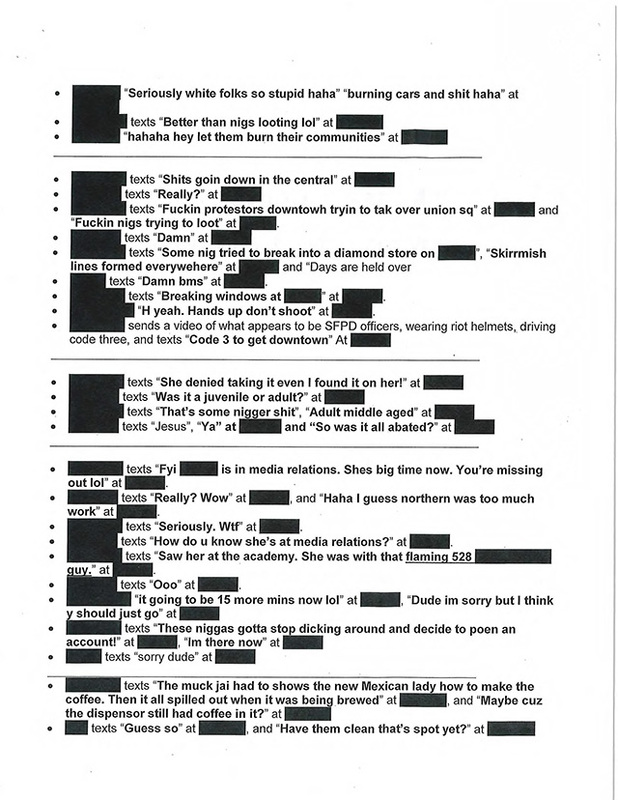 The new batch of texts, nine pages in all, have names and dates redacted, however Suhr has told the press that the majority of them were exchanged between Lai, retired Lt. Curtis Liu, and one other unidentified officer who is also no longer on the force. 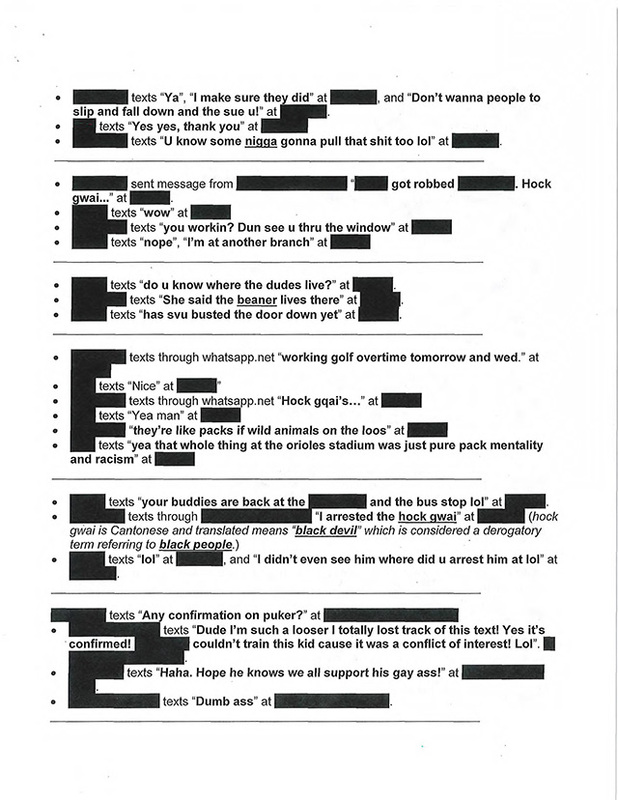 They are mostly from 2015  and as the New York Times notes, it reflects the "measure of the seriousness of the problem" that "the texts were sent last year, just as the scandal of the 14 officers exchanging racist messages was raging." You can read them in full below, if you can handle it. 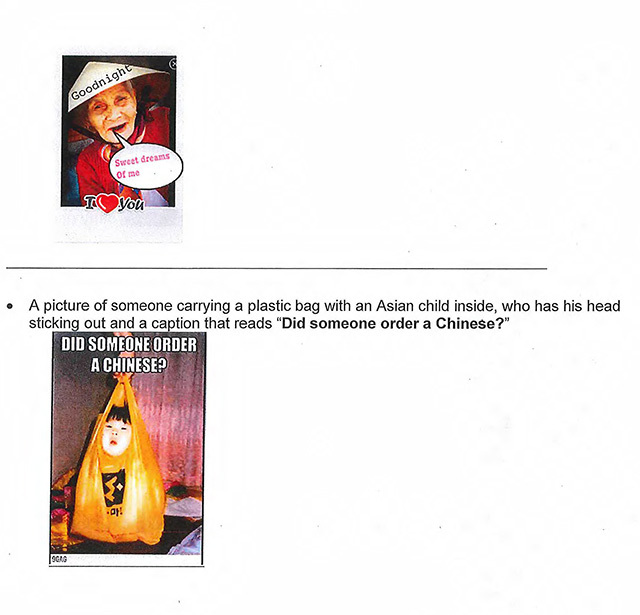 Be warned you'll find frequent use of the N word, and a lot of throwing around of the term "hock gwai" a phonetic misspelling of "hak gwai," which is a Cantonese epithet meaning "black devil" that is used as an offensive term for African Americans. And in an especially insensitive and disgusting exchange, there's an image of a blackened, burned turkey coming out of an oven, and one officer texts, "Is that a Ferguson turkey?" In semi-related news, another officer, 29-year-old Saqib Aslam has been arrested and suspended without pay over felony charges relating to the falsifying of a DMV document, as the Chronicle is reporting.